This weekend (4th Sept 2014) I have been in St Louis, Missouri to speak at First Friday in [St Louis Science Centre](http://www.slsc.org), on the subject of “The Science of Doctor Who”. Of all the talks I have been asked to give over all the years, I don’t think I have felt quite so excited about any of them as I do about this. It feels like I have been preparing for this since I have 10 years old, trying not to look at the Cybermen while watching Doctor Who through my fingers (Silver Nemesis). 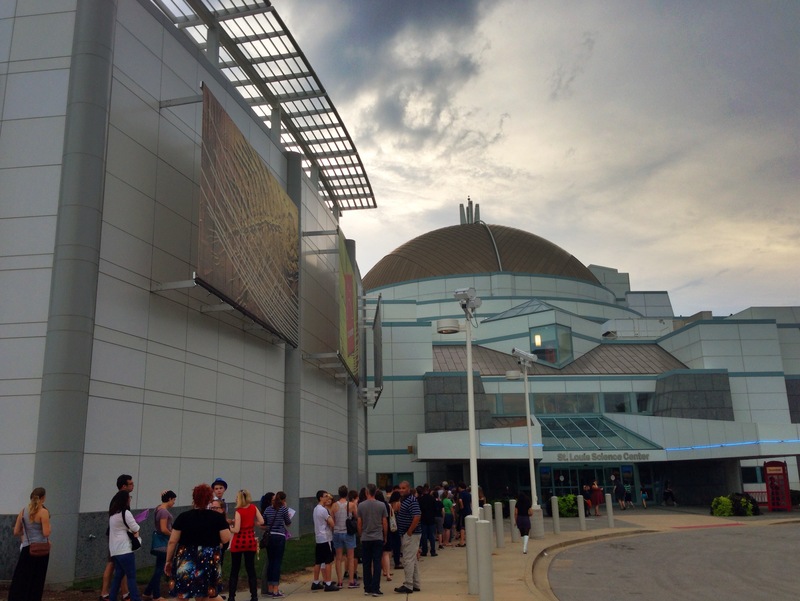 St Louis Science Centre with a queue for tickets that went all the way around the building. Having never done a “Science of -“ style talk before, I wasn’t sure how it would go. 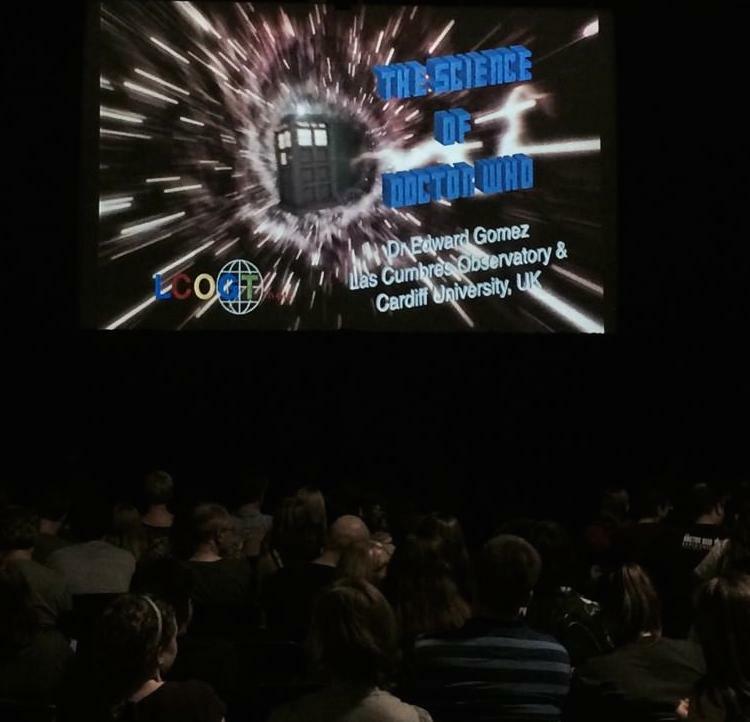 Would most people be there to hear about science or about Doctor Who? Would my british accent, and vocabulary sound strange to them? Could I get the balance between references to Classic Doctor Who and post-2005 Doctor Who right? Would they find the science be unsatisfyingly simple or impenetrably complex? And most importantly, would I have enough Jammie Dodgers and Jelly Babies? I gave my talk, which was a little bit about black holes and wormholes (wibbly-wobbly, timey-wimey) and a little about exoplanets (space-wacey stuff), twice because twice as many people turned up as the auditorium could accommodate. During the first talk there was a spectacular thunder storm which provided an excellent back-drop for discussing supernovae and black holes! One part of the talk I am really proud of is that the comedian Jon Culshaw, did a blistering good intro for me as Tom Baker. In the questions people asked how I managed to record the 4th Doctor, so it was an excellent opportunity for me to thank Jon! For me, giving public talks is one of the joys of being a scientist, particularly when the audience is receptive. This audience redefined what I considered a great audience could be. They were whooping as I walked out on to stage, which is always a great start. I had selected clips from The Runaway Bride, Midnight, and A Good Man Goes to War, to illustrate my talk, which they seemed to really enjoy. The enthusiasm of both audiences really kept the jet-lag at bay and made the whole experience exhilarating. It was a real pleasure having many insightful questions from the audience about science (and quite a lot about Doctor Who). In each session someone asked who my favourite Doctor is (I have 3, of course) and someone asked my favourite companion (I really like Donna Noble, but Peri has a special place in my affections). We finished the night with a showing of The Doctor's Wife (one of my favourite episodes, written by Neil Gaiman) and the classic story The Robots of Death (a Fourth Doctor and Leela murder-mystery episode), which I gave a short intro to. Surrane Jones is quite terrific as the TARDIS and scenes inside the TARDIS make The Doctor's Wife one of my all time favourite episodes. Two of the important messages from my talk were; science is fun and anyone can do it (although it can be hard). Also that everyone should embrace their inner geek. No matter what other people say or think about you, its fine to be a geek, don’t be ashamed of it. It was particularly wonderful that loads of kids (surprisingly there were more girls than boys) wanted to talk to me afterwards, many of which just wanted to say “Hello. I’m a geek. Thanks!”. One girl asked for my autograph (!) and said “Thanks for your talk. By the way Ted Drewes does the best ice cream in St Louis”. She was right! There were some truly imaginative costumes, some of which were captured by the Riverfront Times. Here’s a great video montage from the night which will give you an impression of what it was like. Doctor Who First Friday, St. Louis Science Center from F3-First Friday Flicks on Vimeo. A huge thanks to the friendly, welcoming St Louis Science Centre staff and particularly Jenny Heim (Director of strategic planning and projects) who looked after me like royalty all weekend and made my stay immensely enjoyable. I hope to come back one day!